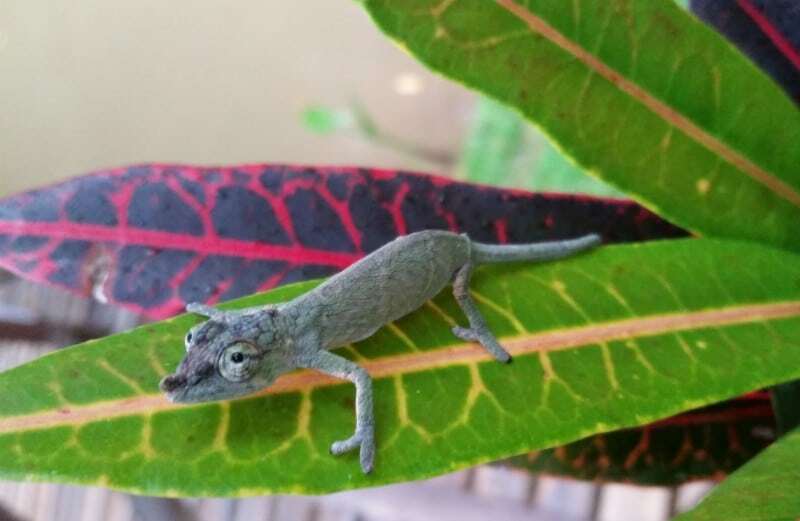 My first chameleon sighting in Madagascar was this horn-nosed chameleon just a few yards from our room near Andisabe National Park. It can actually be a little easier to find chameleons at night, when they turn a pale color that looks almost white against the darkness. We were lucky to see this little guy next to a little creek right after I took even more kingfisher photos. We didn’t spot it; one of the lodge staff pointed it out to us. It was only the length of my pinky finger, maybe a little smaller. It didn’t like me taking its picture. I’d get the camera close to it, and it would crawl over to the opposite side of the leaf. It wasn’t a fast mover– just fast enough to make most of my photos blurry. This one turned out nicely though. Have you seen Madagascar? Maybe he is.